Being a part of BodySpace means different things to everyone. For Tabitha, it's a living network, and she helps it breathe. 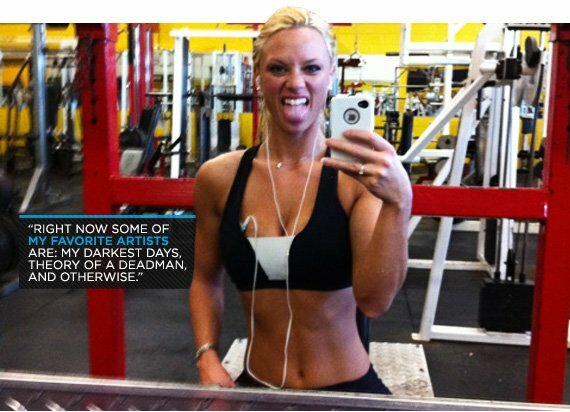 Ultimate Goal: Compete in the Olympia in Bikini or eventually figure. BodySpace is home to athletes from all walks of life. Many of us are regular folks just looking to improve our physiques, score some self-confidence and live healthier. While our beloved social network levels the playing field, gives everyone equal access, we still love to feature the biggest, strongest, most athletic, beautiful, gifted and advancing people of BodySpace. This month we introduce you to Tabitha Klausen-Leandri, a 3-year pro on the IFBB circuit and a fixture on BodySpace since 2006! This statuesque beauty loves her leg workouts and she threw the javelin in school. Learn more from this splendid mixture of female elegance and enduring strength … congratulations Tabitha! I have always enjoyed being active. I was a hyper child. I would go to my local gym with my girlfriends. I just didn't know what I was doing. I had a friend who had been lifting since he was 14 show me a few things in the gym and that guy became my "trainer" and eventually my husband! He helped me overcome my eating disorders and realize starving myself, working out, and taking fat burners was doing absolutely nothing for me and introduced me to a proper diet. I have changed my ENTIRE life since I decided to start eating healthy and lifting seriously.I became a certified trainer, fitness model, started competing and turned into an IFBB Pro! My whole life revolves around bettering myself, helping others become healthy through personal training and competing. My husband introduced me to BodySpace. He would constantly be checking his profile and putting up pictures as well as motivational blogs. I was like "What are you doing on there, you are obsessed!" He kept telling me how great it was and I finally decided to make a profile. Before long I too was hooked on BodySpace! I was so excited to find a place where my husband and I were accepted and supported in our fitness lifestyle! Take us back … how did it feel to win your pro card? I was in kind of a shock! At first I was a little disappointed that I didn't win my class, but then I was like, "Hey I won my freaking Pro card, I am an IFBB Pro!" BodySpace has given me the support from other members and the motivation from looking at their progress pictures or seeing physiques I wanted to attain. It is funny hearing people say they want to aspire to achieve my physique, now, because I can remember saying that to people on BodySpace I would look at DAILY for motivation! I love uploading my progress pics, and going through them and seeing the changes in my body from when I joined BodySpace. I also enjoy looking at other BodySpace member's transformations! It motivates me! My favorite muscle group to train is my legs. I train my hamstrings twice per week, but I do a full leg workout once. For each exercise I do two heavy sets of 10-to-12 reps. Immediately following the second set I do a drop set (I lower the weight and perform 10-to-12 additional reps, to failure). You've been on BodySpace for a long time, how do you stay motivated for the long term? I stay motivated by always looking to better myself. Competing and looking my best for my shows is a huge motivator. If I need a boost I will change up my workout, look at people who inspire me, or download some new music to my iPod! When I first started training I was getting over my eating disorders. I had a great "trainer" who knew what he was doing, (my husband) but I wasn't eating barely anything. I was working out, and I was drinking energy "fat-loss" drinks. I was killing myself! With support from my husband, I battled my eating disorders and began fueling my body with healthy foods that would give me energy and help me build muscle for the physique I wanted. Are you bothered by some of the stereotypes of bikini models? What can you do to offset those opinions? I used to get upset by negative comments, but then I realized that those people knew nothing about me and were negative and ignorant. I am proud of what I've overcome and of who I am today. People tell me I inspire and motivate them and that's what really means a lot to me. I want positive people in my life and to be a positive influence on others. I work very hard, and I think people see that now from online videos I've done over the years. I love taking my CytoSport supplements. I have wheat/gluten/lactose intolerances and the products I use in their different product lines are free of these ingredients and don't upset my stomach! A healthy diet, hard training, great supplementation, and proper recovery and sleep are the keys to getting the body you want. You just have to find the right combination for you! Too many times I have clients who neglect one or most of these things and can't understand why they are not getting the results they look to achieve! I listen to everything except for classical and bluegrass! Haha, really anything that pumps me up and motivates me. Right now some of my favorite artists are My Darkest Days, Theory of a Deadman, and Otherwise. I have never found a more supportive and inspiring health and fitness environment than on BodySpace. You can meet people who are going or have gone through similar transformations, who have the same fitness interests, who have the same fitness goals, or who can inspire you! It is an online family of like-minded people and it's awesome to have them on your journey to a better healthier lifestyle! I would like to say thank you to them for inspiring me on my own personal fitness journey! A few people I followed who motivated me the most were Ava Cowan, ChickenTuna, and Jamie Eason. I would look at their pictures and pray that I could look like them or be where they were one day. I loved watching Ava's videos well before she was huge in the industry. She had everything down, diet, training, and AMAZING abs! As a personal trainer, how does BodySpace help you? When I wanted to become a trainer, I had no idea how to get certified or what certification to get. I was able to talk to certified trainers on BodySpace and figure out what was best for me. I have also found training clients from BodySpace. They can see the progress I've made and see my achievements and qualifications even before talking to me. They are either local to me and found me through BodySpace or they are long-distance and we do online training. BodySpace's format has changed, but it still remains the supportive fitness community that I love! I would like to thank Bodybuilding.com for choosing me as their member of the month. It means a great deal to me, because honestly BodySpace has changed not just my life, but my husband's as well. We found a very supportive place to talk about and learn more about what we love, and to show our hard work to people who appreciate, understand and encouraged us. We are forever thankful to BodySpace! I Have a Facebook fan page under Tabitha Klausen. I am also on Twitter and Instagram with the username Tabifit.